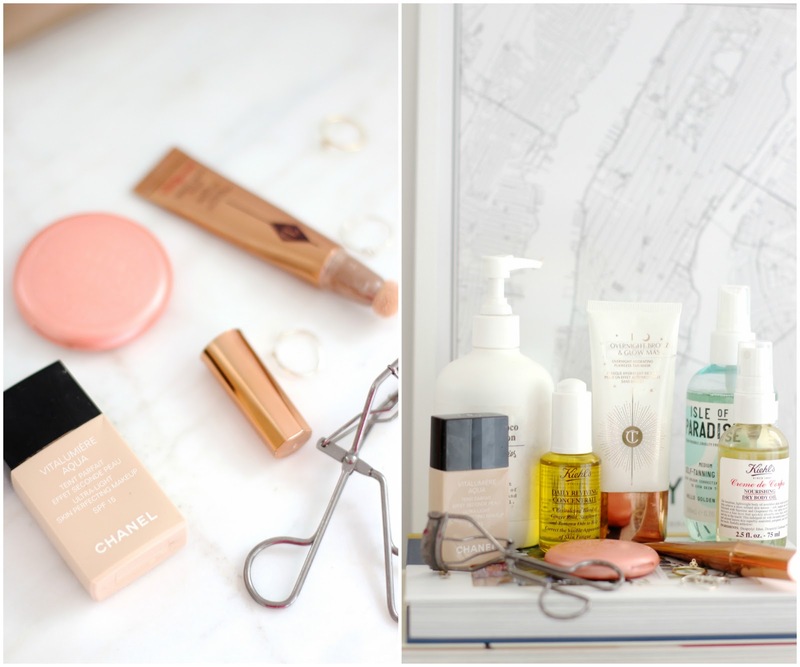 Summer Beauty Swaps. | By Millie. I love switching up my routine when a new season rolls around, and Summer is no exception. The legs are out, the toes need to be painted, and the dewy skin trend is in full swing. With all those factors in mind, there are a few changes I like to make, and some products I like to switch out. I’m going to start with some body care favourites I’ve been slathering on my limbs. The first is a fake tan, and it’s no shocker that I’m mentioning the Isle of Paradise Tanning Water in Medium. This seems to be Instagram’s favourite fake tan at the moment, and I can see why so many people rave about it. When I first tried it out I wasn’t thrilled with the results I got – I have a huge streak on my thigh and a few patches of tan which I had obviously missed in the blending process. As it doesn’t have a guide colour, it can be a bit scary on your first use, and learning from experience you really need to spend a bit longer blending it all in with a mitt. I braved it, and went in for a second try and I have to say I did really love it. The colour is the most natural bronze shade I’ve ever received from a fake tan, and it seems to stick around for good 5 days. The initial smell is gorgeous, very fresh and fruity, although that pesky fake tan smell does seem to creep in the longer you leave this on the skin. I leave it brewing overnight, then rinse in the morning and I’m so happy I persevered with it. To keep my limbs soft and moisturised, there are a couple of products I reach for. 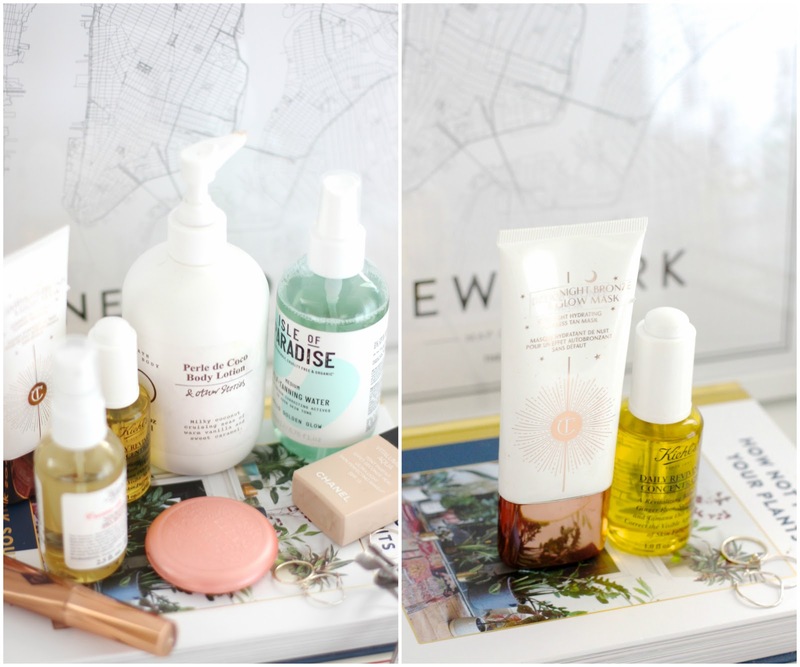 The first is a lotion from &Other Stories – if you haven’t tried any of their body care products, you’re seriously missing out! This body lotion is their Pearl De Coco scent and it smells oh so lovely, very sweet and full of coconut, vanilla and caramel – what a combo! I also love that this comes with a pump, that makes it really fuss free to use. The formula of this is lovely, it leaves my skin super supple after every use and it sinks in really well, so you can use it AM. I get a lot of compliments on how I smell when I wear this, so that’s a sign it must be alright! Next up is the Kiehl’s Body Oil, an absolutely gorgeous product which is in a handy dandy spray. I personally think every oil should come with a spray cap, it’s genius and makes it a lot less messy. The smell of this is glorious, it’s quite sweet again, but those are the scents I love in the summer. This is a great one to use in the evenings before heading out as it gives your skin a gorgeous glow, as well as been really moisturising at the same time. The fact this also comes in a mini size is amazing, makes it the perfect travel buddy. On my skin, I don’t change too much, but I do like products which are going to give me an extra bit of glow. 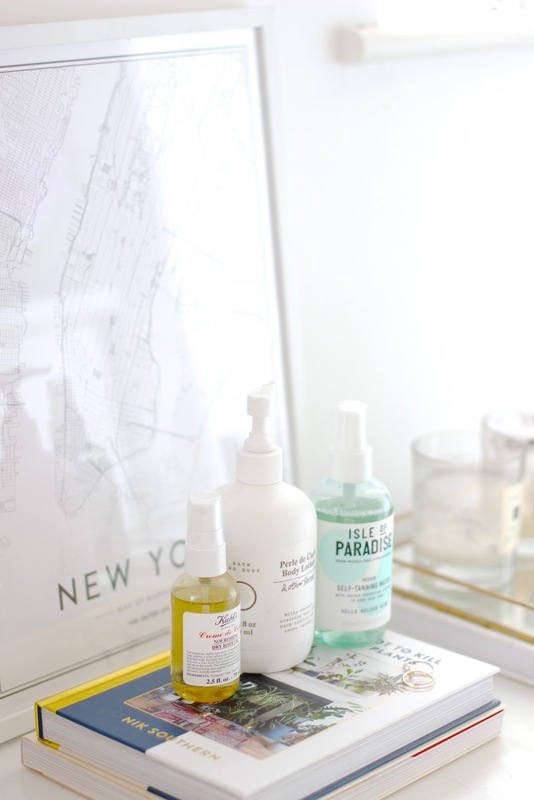 Oils are a great way to give your skin a dewy finish and an extra dose of moisturisation. I still don’t like anything too heavy which may clog the skin, so the Kiehl’s Daily RevivingConcentrate has been a dream to use. It has nice a fresh scent, and it applies beautifully to the skin. You can either use it on it’s own, or mix in with your daily moisturiser or foundation for that added nourishment. Kiehl’s do oils so well in my opinion, and my dry skin absolutely laps this up. If you’re worried about oils being too much for your skin, try this one out as it’s more of a lightweight formula. As an added step in my PM routine, I've been reaching for the Charlotte Tilbury Bronzing Overnight Mask to ensure my skin isn't a million shades lighter than the rest of my body. I find this a really subtle, and natural, way to give my skin that beautiful sun-kissed look, but without the harmful rays of the sun itself! I take around a 20p sized drop and work it in the skin with my fingers. Make sure you get every nook and cranny, you don't want any strange pale patches! Always wash your hands after using a product like this, there's nothing worse than fake tan hands. I really love this as a facial fake tanner, it gives my skin a boost of radiance, a boost of bronze, what more can I ask for. My makeup preferences lean more on the light-weight, creamy side, which you probably all know by now. 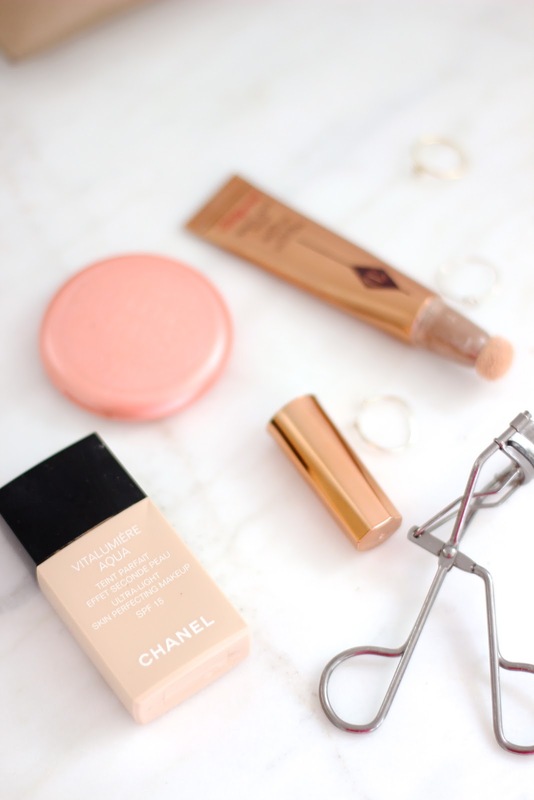 I love reaching for my ChanelVitalumiere Aqua Foundation, it has beautiful buildable coverage that never looks too much on the skin. It’s a natural, dewy finish which still lets your own skin shine through. For an everyday foundation, you can’t go too wrong with this one. Plus, if you’re in a hurry you can apply with fingers and it will still give a flawless finish to the skin. 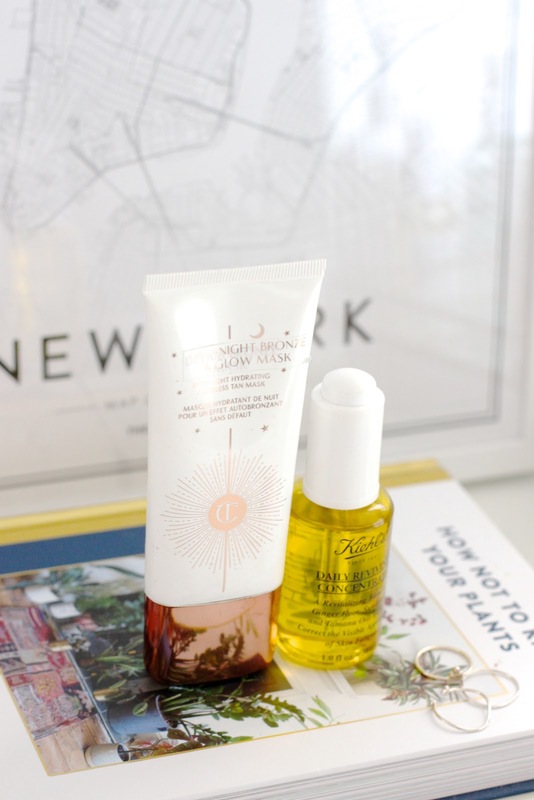 Complete with SPF, this is the perfect summer base. On my cheeks, I’ve rediscovered my love for the StilaGerbera Convertible Colour. This is a multi-use product, so can be applied to both your cheeks and lips to give a flushed, seamless effect for your makeup look. This specific shade I can’t personally pull off on my lips, it’s a bit too pale for my liking, but as a cheek colour it works really well. I simply bop my beauty blender in, and dab on my cheeks. You don’t need a lot of this, so start small and build up. The rosy pink shade gives off such a gorgeous natural sheen to the cheeks, and the formulation of these last really well on the skin. To top that off, I go in with a few dots of the Charlotte TilburyLight Wand on the high points of my face, and blend! This has quickly become a favourite of mine, the golden champagne shade works wonders on my skin tone and the glow it gives off is truly stunning. If you love a cream highlight and you don’t yet have this, you need to pick it up!